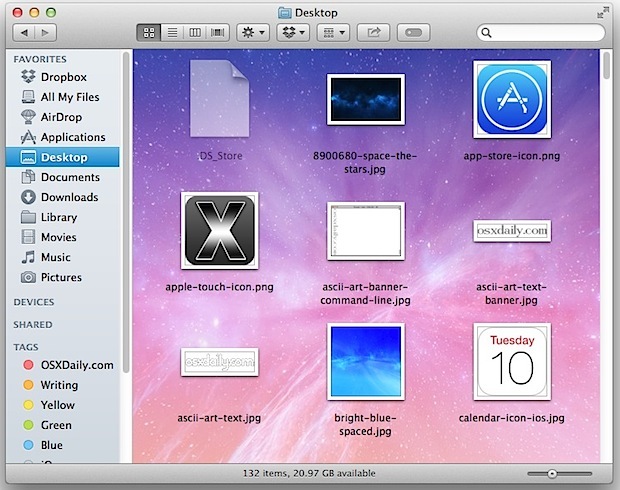 Did you know that you can customize the backgrounds of any Finder windows in Mac OS X? This is a nnice way to customize the appearance of your Mac a bit, and you can either choose images or colors, or go with the default setting of a simple white background. That’s all there is to it! Have some fun customizing your windows, you can really get as adventurous as you want with the appearance, with crazy colors or subtle wallpapers, it’s your choice. You can also easily remove the background customization and reverse whatever changes you made by just opening View Options again and selecting the ‘White’ background, which is the Mac OS default setting. This walkthrough came in response to a reader inquiry, as Karim S reminded us when he wrote in asking: “I was wondering if you have any tips to change the background color of the finder’s windows. I would like to see the white turned into a light grey.” In Karim’s case, he would want to set a grey background and then click on “Set as Default” so that all Finder windows have the same background. This applies the setting everywhere. Is this the right Show View Options window? I’m with you. I get nothing like whats in the photo. You’ve got to choose “show as icons” in the titlebar. Oh, I see it now. Thank you for the clarification. question? and if want collumvieuw with colered background. is there a way around .terminal? Make sure you have a Finder window open, preferably like your home folder and in icon view. You’re in the right view options menu, it’s actually a floating window and will change to accommodate the selected window whatever it may be in the Finder, but again no icon view = no custom background. I have mine set similar to OP picture, but I use a gradient background I created and it looks nice. is there anyway of changing the text colour in each folder window in this way? i changed the background image to something very dark and now i can’t see the text unless i highlight it. Off the top of my head, a very simple solution is to use folder Labels to color behind the text. thanks a bunch for this, my 25 inch was burning my retinas out. Weird how u only see this option in icon view, which is why I never new about it as I use column view always. I don’t know why but if you organize a folder by any criteria (name, size, etc.) the background colour defaults to white and the background box will be grayed out in the view options. If anyone knows a workaround for this, please let me know. Why my finder window don’t show the “search for” items? I can find it even in the system preferences! I came here after a search attempting to find out, once again, what I knew before and then forgot…. – a keyboard shortcut for applying one’s customized windows appearance settings “in totality”…. To force items (in icon view) to adhere to grid positions and be organized alphabetically, I press control-command-1…that snaps it all neatly and cleanly – BUT – it does not apply the default appearance settings I once created…and I used to do that, all of it, with a three or possibly four-key shortcut…and then I forgot it…. I have tried option-command-shift plus any number of letters, but no….I am fairly certain that “control” was never involved. Has anyone noticed that you can’t change the background when a selection has been made for “Arrange By”? I don’t really care to use the background option, but I’m curious as to why it would be greyed out when you have arranged by something. Thanks for this hint!!! I was almost going nuts, because noone ever mentions this. It has to be Icon View and Arranged by Name to have a colored background option. Here it is 2015 and we have El Capitan OS X. Why are we still looking at basically a greyscale OS ? The Finder windows are the same as they were when they released OS8. Android and Microsoft have changed the look of their operating systems with each upgrade. Black, white, grey, and blue is boring and ugly. My children hate the look of it. The CEO at Apple should stop thinking about watches and electric cars and give us an OS that looks more like color than a black and white tv. I have OS 10.6.8. I usually work with imagery, often dark underwater photos, and the bright white window backgrounds (when you drag the window open wider so that the image floats in the center of a nice, blank field) were making it impossible to see subtle detail in the dark images. Years ago I was shown a simple way to change the backgrounds to a more comfortable shade of mid- to dark gray. Ahhh, what a difference! I selected this as the “default,” and all my images henceforth opened up with this pleasing background (visible only when I dragged the window corner out, of course, to comfortably work on the image). Then my computer did one of its spontaneous and very annoying “desktop scrambling” resets where, all of a sudden, all my carefully positioned files are suddenly alphabetized and re-organized on my desktop in ways I don’t want them. This time, many settings were lost, and now all the window backgrounds are back to blinding white. I had forgotten the simple way to set these background colors/values. After much searching, checking Finder, Mac Preferences, Mac “help” and YouTube tutorials, with absolutely no results, I finally found this page which appeared to address my question. I followed Mr. Pearson’s steps to the letter, and his screen grab is exactly what I get myself, but I do not see the “Set as Default” button that he repeatedly describes. I see “Use as Defaults,” as shown in his own capture, and clicking on it only saves the new background in the single icons window I had opened. It does not default to ALL windows. I did it again. Repeatedly. I then tried opening up an image and dragging the window wider to see if the background had been changed. Nope. Only the window with the icons/thumbnails. I need the dark gray background behind IMAGES, not the icon windows. How the heck do I adjust the background color/brightness behind an image, when I drag the window open wider so that the it floats in the center of a nice, blank field?? Can anyone help? Searching every combination of the words “change,” “window” and “background,” etc., I can find absolutely ZERO assistance for this on the internet. Again, I don’t care about the windows with icons in them; I’m referring to the window background behind the actual images when I open them up to work on them. Ken, it’s Preview that opens your images, so with Preview open, click on the Preview App title in the menu bar, then preferences, you’ll see ‘window background’ as an option there. Thank you, but Preview doesn’t open my images when I want to work on them, Photoshop does. When I click on a desktop folder, Finder opens it. When I click on a .png or .tif image, Preview opens it. Dragging the corner of a tif image/window wider, I can indeed control the color/brightness of the background field through your method. But I cannot work on a tif image in Preview, only view it. It must be opened in Photoshop to work on it. So my question remains: How do I change the background field brightness behind an image that I’ve opened and want to work on — in Photoshop? Dragging the bottom right corner of the image out wider and/or downward reveals a light gray field/background that is highly annoying when studying/working darker images. A search through Photoshop “help,” preferences, Google, YouTube tutorials, etc. gives no clue as to how to change this bright background/field, something that would seem to be a very basic task. Modernape, if you will reconsider my issue with the above info in mind, I would be very grateful. Thanks!